hile these special features are enticing, it’s best to ask your dentist if they’re right for you or if you need them at all. 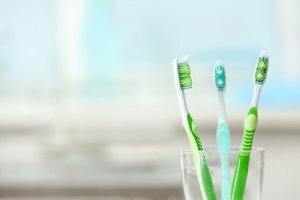 There are, however, some toothbrush basics that you need to know — these tips should make your search for a toothbrush a whole lot easier! r bristles are easier on your gums. When you brush, you want to clean your teeth, not make your gums bleed. A toothbrush with stiff bristles is more likely to cause bleeding gums. However, don’t pick a toothbrush that’s labeled “soft” unless your dentist recommends it; choose a “medium” one instead. nd wear out faster than standard toothbrushes. Until there’s more information about natural toothbrushes, it’s probably best to stick to an ADA-recommended toothbrush with medium-soft, nylon bristles.